Pursuant to paragraph 12 of the General Assembly resolution 71/222 of 22 December 2016 entitled “International Decade for Action, Water for Sustainable Development 2018-2028”, the President of the General Assembly appointed H.E. Ms Katalin Bogyay, Ambassador, Permanent Representative of Hungary and Mr Lukmon Isomatov, Head of Department of External Economic Cooperation at the Ministry of Foreign Affairs of Tajikistan, as Co-Moderators of the working-level dialogue to discuss improving the integration and coordination of the work of the UN on the water-related goals and targets under sustainable development pillars, with particular emphasis on the 2030 Agenda for Sustainable Development, while preserving its integrated and indivisible nature, and a subsequent working level dialogue to take stock of the discussions at the first dialogue and exchange views on the relevance of possible next steps. 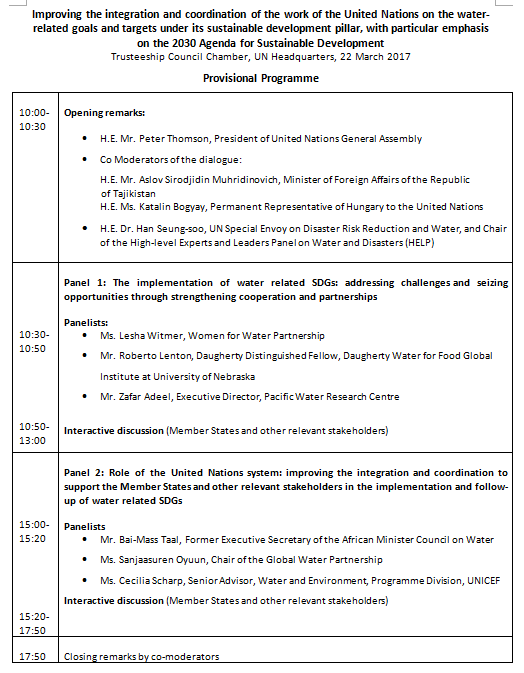 The first dialogue takes place on 22 March 2017, coinciding with the celebration of the World Water Day, and aims to identify current pressing gaps and challenges as well as appropriate recommendations. The second dialogue, whose date will be decided later, should offer the opportunity to take stock of the progress made and exchange views on possible next steps. The outcome of the dialogues is a Summary to be prepared by the Co-moderators. the implementation of water-related SDGs: addressing challenges and seizing opportunities through strengthening cooperation and partnerships. the role of the United Nations system: improving the integration and coordination to support the Member States and other relevant stakeholders in the implementation and follow-up of water related SDGs. Member States are invited to engage in interactive Panel discussions and are highly encouraged to keep their interventions to less than 3 minutes per speaker. There will be no prior list of speakers for this meeting.